“Tu-tu…” was one of the first sounds from the forest. 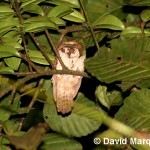 Our first night on Gunung Kerici was started by a calling Mountain Scops-owl (Otus spilocephalus). Another Swiss birdwatcher Fabian Ducry and I were accompanied by the Belgian birder Bram Demeulemeester and by our home stay host and guide Pak Subandi. 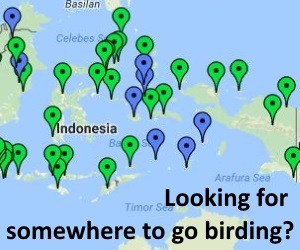 During a good week of birdwatching in the Kerinci-Seblat National Park, Bram and we spent around four long evenings in the forest with the mission to find secretive Sumatran montane night birds. Equipped with microphone, speaker and spotlight, we followed our ears to find the endemic Sumatran Frogmouth (Batrachostomus poliolophus), the nearly-endemic Rajah Scops-owl (Otus brookii) and other specialties as Salvadori’s Nightjar (Caprimulgus pulchellus) and Dusky Woodcock (Scolopax saturata). The Mountain Scops-owl opened our first birding night, but only acoustically. Anyone who has ever searched a Mountain Scops knows that finding it is very hard as they like to stay in dense tree cover. As we have seen it earlier in the mountains of Sabah, we decided to leave the two males in peace which were singing against each other over a small valley. A fine and repeated, “…zic…” then took our attention; this was a Dusky Woodcock calling in flight. More were heard during the following nights while singing their weird song reminiscent of a starting generator and one was even seen flying very close through the middle of our group. Barred Eagle-owl (Bubo sumatranus) and Barn Owl (Tyto alba) were calling too, but a much smaller bird was the highlight of that night. 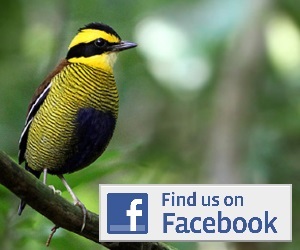 From a dry river bed, we heard a Sumatran Frogmouth with its mournful, descending whistle. Soon after we played back its call, it came closer to inspect its virtual enemy and we managed to see this ghost-like bird with its long nostril hairs around its massively broad beak. The short tail confirmed again its identity as it was called Short-tailed Frogmouth a few years ago, when it was treated conspecific with the Bornean form which is now called Bornean Frogmouth (Batrachostumus mixtus). This first successful night was followed by more, but one was especially worth remembering. A very fast rattering sound announced at least two singing Salvadori’s Nightjars over the forest. So, the only big target left was the most difficult Rajah Scops-owl. After about an hour, we heard the first one but it kept its distance to us. 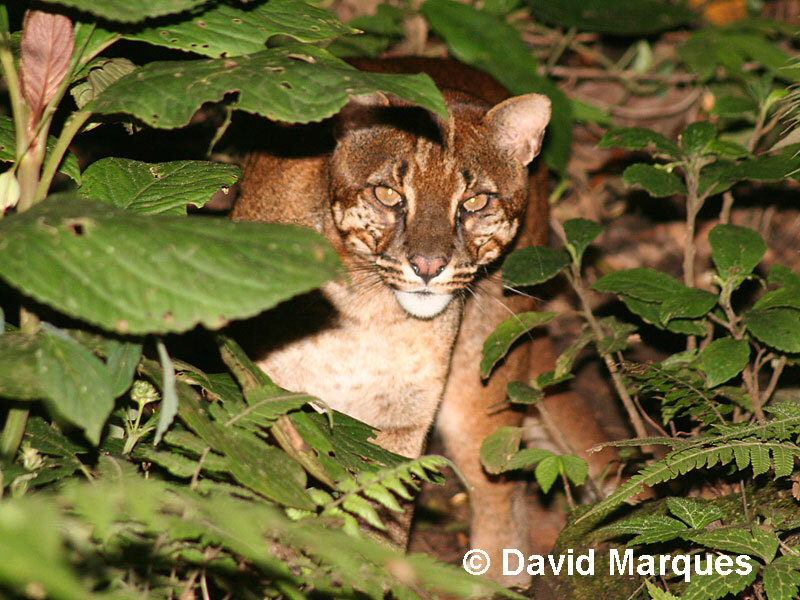 A little later, we heard a movement, Bram switched his spotlight on and in front of us was not a Scops-owl but a big cat – an Asian Golden Cat (Catopuma temminckii)! It stood still about ten meters in front of us, confused by the strong torchlight, and then it approached for another few meters. 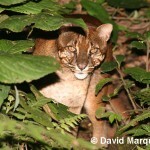 While our hearts were beating very fast, we managed to take some photographs before the Asian Golden Cat heard dry leaves cracking under our feet and disappeared into the dense forest – a truly amazing observation of this rare and secretive cat! We continued our search for interesting birds. 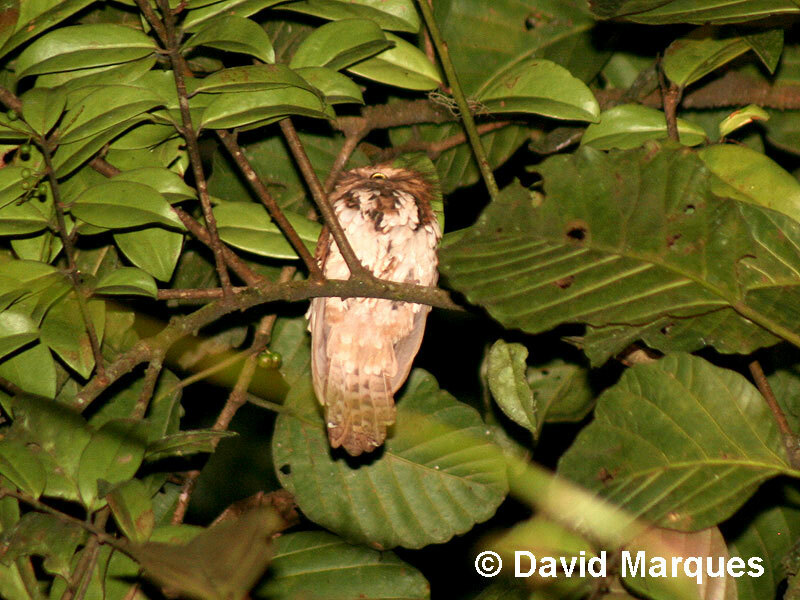 After a short encounter with a Small-toothed Palm Civet (Arctogalidia trivirgata), another bird was singing loud in the bushes – an Oriental Bay-owl (Phodilus badius). Unfortunately, the bird was quite far away from the trail and we had to leave the trail to get nice view of this beautiful owl. The only problem then was to find the way back to Kersik Tuo. Luckily, the Ramadhan all-night-long prayers showed us the way. After climbing through thickets and loads of rattans, we were suddenly attacked by a group of small Babblers. They were sleeping in the thicket and upon our approach they flew away in panic: A Spot-necked Babbler (Stachyris striolata) was landing on my hat, a Pygmy Wren-Babbler (Pnoepyga pusilla) on Bram’s trousers. Another 40 minutes later, we managed to find the forest edge and our way back to our sleeping bags – ready to dream from these exciting nights in the forest.